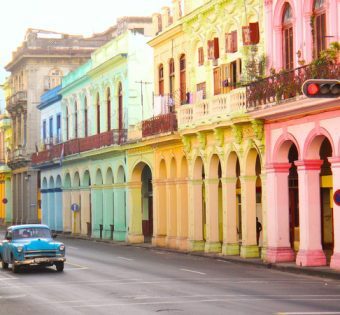 Before the 1959 Revolution, Cuba was a popular tourist destination for United States citizens, mainly due to a large number of casinos catering to gamblers put up by the American mafia. Revolutionaries claim the Batista dictatorship was a government that neglected many of its own citizens' health and welfare in order to maintain itself in power. Many Americans had beach homes during the summer and rich American companies owned large factories and land with the cooperation of Fulgencio Batista, the ruling military dictator. Since the Revolution, Cuba has been subjected to a trade and economic embargo by the United States. While travel between the two neighbors is restricted, it is still possible, though illegal for most US citizens. Since 2009, US citizens with relatives living in Cuba are allowed to visit Cuba. After 1959, Cuban tourism was mostly for Cubans only, and the facilities were not renewed until the 1990s when Cuba lost financial backing from the defunct Soviet Union and opened its doors to foreign tourism. Now many European, Canadian, and even American visitors come to the island. In the typical tourist regions like Varadero and Holguin, a lot of modern 3-star to 5-star hotels are available, while in less popular tourist regions visitors are still able to rent rooms in many Cuban homes (called Casas particulares). Due to several long-standing factors (e.g. bureaucratic ineffectiveness, the U.S. embargo, lack of resources, and the loss of Soviet subsidies), much of the country's infrastructure is in need of repair. In major tourist destinations, there will generally be few problems with either power or water, although such outages may occur. Electricity outages have been common in Cuba, except in tourist facilities that have a generator.